It was a foggy morning and I felt a chill as we saw the tracks in the dirt leading away from the house…..was it a bear, a monster? No, thankfully it was only my eight year old son, Adam wearing his new Clawz Shoes! Clawz Shoes are the trendy new shoes for kids, teens and adults. If you and/or your child like to make a statement and be a little “wild” then these are the perfect shoes for all of those exciting spring and summer adventures. What makes this brand so unique is that these shoes aren’t just stylish but also very comfortable to wear too because of the ergonomic design. 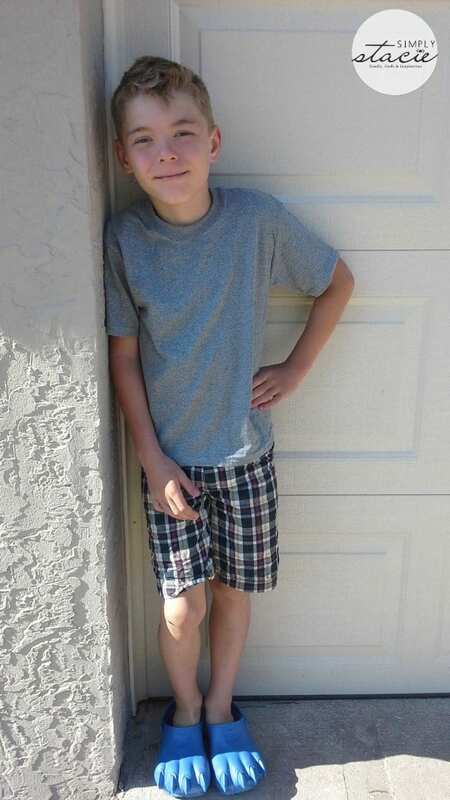 Adam thinks that his slip-on Classic Clawz Blue Shoes (SRP $29.99) are “awesome” to show off his fierce inner beast and the cushioned heel support allows for full flex to make it easy to walk, run and play all day. The solid rear strap helps to keep the shoes securely in place and it can be folded forward to make slipping it on and off a breeze. Adam said that he really likes that he can move around in these shoes without slipping which is a great feature. One of the things that I quickly discovered when raising my three children is that their shoes get stinky….very stinky! 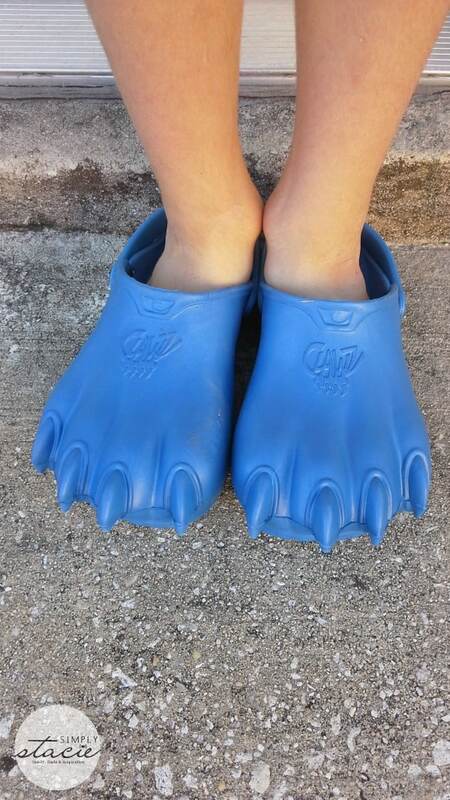 Therefore, I appreciate that Adam’s Clawz Shoes have an air vent to help keep his feet cool and I can easy clean the shoes as needed with soap and water. In fact, Clawz Shoes are designed with special materials to help repel odor while actually molding to the shape of the foot for an extra comfortable fit. I love the fun, stylish colors which are fresh and bright for spring including blue, pink, lime and orange as well as classic white and black. The Clawz Shoes website makes it easy for parents to find the right sized pair of shoes by simply measuring the length from the heel to the tip of the big toe and then consult the size chart to get the perfect fit. 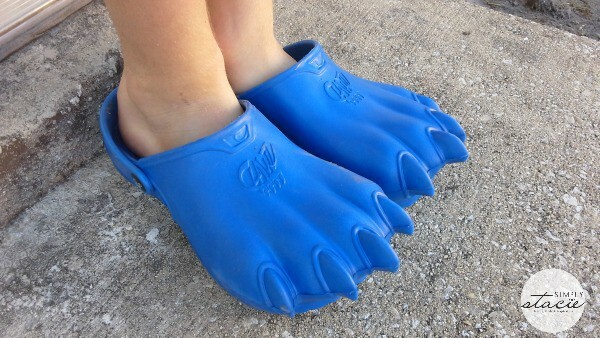 Clawz Shoes are a big hit with my eldest son and my two younger children are begging for a pair of their own too. With the special offer exclusive to Simply Stacie readers, I can afford to buy one pair for everyone including my husband and I too so that we can all “walk on the wild side” together! I learned that your items will ship within 72 hours of placing your order. i learned that my dd would love these,b/c they come in pink. I like the kids Classic Clawz in Black. I like all the different colors they come in!! I like the Men’s Black Clawz. I’m surprised that there are Clawz in adult sizes. I would like a blue pair for myself. I love the pink Clawz!